Situated on top of the Benacantil Hill in Alicante, Santa Barbara Castle aka Castillo de Santa Barbara is the largest medieval fortress in Europe. Trivia- the Arabs who settled and ruled Spain for 5 centuries are the builders of this Castle. It was constructed some time during the 9th Century. It was first opened to the public in the year 1963. From the top, one gets magnificent views of the city of Alicante. Guided tours of the castle are conducted for a small fee. On the tours, you will find out fascinating facts about the castle. The approaches to the castle are mainly 3- one can either hike up, or there are two elevators that take you to the top or one can drive up to the top. You can also find a small museum within the castle premises showcasing the history of the Castillo de Santa Barbara. Entry is free for children under six years. A deposit of €20 or ID or Passport and €2 for the tour. Minimal charges may apply for the use of elevators. Guided tours are usually conducted at 11:00 am and 12:30 pm. Elevator Timings: 10:00 am to 7:30 pm. Elevator in front of the Postiguet beach. A Cafe atop the mountain, in the castle premises. How popular is Santa Barbara Castle? People normally club together Mount Benacantil and Alicante Museum Of Contemporary Art while planning their visit to Santa Barbara Castle. I have to say that it it’s one of the most amazing views I have ever seen. This fortress takes you to the medieval times, or even gives you the feeling of being in a movie. Guess what? It’s absolutely free, no tickets to visit it something that blew my mind, in Spain to even enter in a cathedral you will have to pay 5€. Well done Alicante... many other towns should follow you example. Wonderful and scenic views. Worth the €2.70 to take the elevator up. There are so many great spots to take photos. You can see the whole city from here. So many mountain ranges to see. 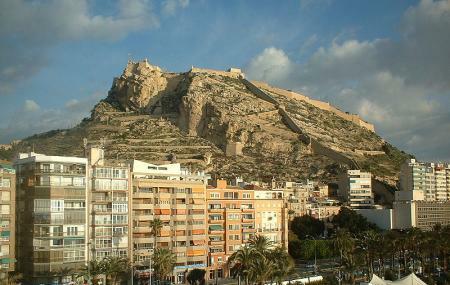 Beautiful castle, really nice view over Alicante in all directions! The sunset from there is amazing and you can even take the elevator up for ca. 1,20€ and the entrance for that is from the beach. You can buy snacks on top but they are quite expensive in my opinion. Great experience with beautiful views. The hike up there was intermediate with slight elevation change and very slippery because of the cobble stones and granite. However, there is an elevator for 3 euro. The castle itself is free to enter, many restrooms, one cafe at the top for little sandwiches and drinks, and one restaurant. There is very little shade on premise and would be advisable to wear sunscreen or bring a hat. The views itself is reason to keep coming back.